SEE SCREAMING YOUNG GIRLS SUCKED INTO A LABYRINTH OF HORROR BY A BLOOD-STARVED GHOUL FROM HELL! This horrifying feature-film debut from director Monte Hellman (TWO-LANE BLACKTOP, COCKFIGHTER) is an enjoyable “monster on the loose” classic! A group of thieves arrive in the snowbound town of Deadwood, South Dakota and they have no intention of vacationing… they’re planning a giant gold heist. Exploding a bomb in a nearby mine to create a diversion, they successfully rob the local bank… and unknowingly unleash a creature from the bowels of Hell itself! The group hires a ski instructor to take them to an isolated cabin and, as night falls, they fight for their lives as the foul creature hunts them down… kidnapping and sucking all the blood from its victims in the mysterious “haunted” cave. 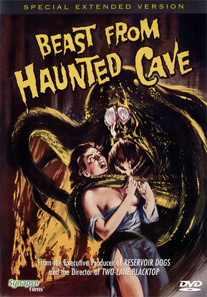 After BEAST FROM HAUNTED CAVE was released theatrically, Hellman filmed additional scenes with the original actors for the television broadcast a few years later. Finally available on DVD in the uncut extended version containing almost ten minutes of additional footage, BEAST FROM HAUNTED CAVE is a treat for fans of Monte Hellman’s work and is sure to please anyone who loves classic horror films of the 1950s.